a Seat of the ਅਫ਼ਰੀਕਨ ਸੰਘ ਸੰਸਥਾ. b Seat of the ਪਾਨ-ਅਫ਼ਰੀਕਾ ਸੰਸਦ. ↑ "African Union anthem, etc.". Africamasterweb.com. Retrieved 26 November 2012. ↑ Dixon, Robyn (25 March 2013). "African Union suspends Central African Republic after coup". Los Angeles Times. Retrieved 25 March 2013. ↑ "Haiti – Diplomacy: Haiti becomes a member of the African Union – HaitiLibre.com, Haiti News, The haitian people's voice". Haitilibre.com. Retrieved 26 November 2012. 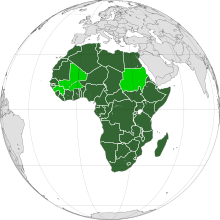 ↑ "Kazakhstan was granted an observer status in the African Union". Ministry of Foreign Affairs of the Republic of Kazakstan. Retrieved 30 January 2014. 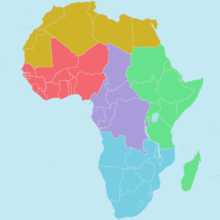 ↑ "Latvia becomes observer to African Union". Ministry of Foreign Affairs of the Republic of Latvia. 14 November 2013. Retrieved 30 January 2014. ↑ Fathya el-Dakhakhni (27 May 2013). "AU grants Palestine observer status". Egypt Independent. Retrieved 30 January 2014. ↑ "Mrkić na samitu u Adis Abebi". B92. 30 January 2014. Retrieved 30 January 2014. ↑ "Serbian FM urges African Union support". B92. Retrieved January 30, 2014. ↑ "bilateral relations". Embassy of Serbia in Ethiopia. Retrieved 30 January 2014. ↑ "Press Release Regarding The Participation Of H.e. Mr. Bekir Bozdağ, Deputy Prime Minister Of The Republic Of Turkey, In The 18th Ordinary Session Of The Assembly Of The African Union". Ministry of Foreign Affairs of Turkey. 28 January 2012. Retrieved 30 January 2014.